The Boston Athenæum is one of the oldest independent libraries in the United States. It is also one of a number of membership libraries, for which patrons pay a yearly subscription fee to use Athenæum services. The institution was founded in 1807 by the Anthology Club of Boston, Massachusetts. It is located at 10 1/2 Beacon Street on Beacon Hill. Resources of the Boston Athenæum include a large circulating book collection; a public gallery; a rare books collection of over 100,000 volumes; an art collection of 100,000 paintings, sculptures, prints, drawings, photographs, and decorative arts; research collections including one of the world's most important collections of primary materials on the American Civil War; and a public forum offering lectures, readings, concerts, and other events. Special treasures include the largest portion of President George Washington's library from Mount Vernon; Houdon busts of Washington, Benjamin Franklin, and Lafayette once owned by Thomas Jefferson; a first edition copy of Audubon's The Birds of America; a 1799 set of Goya's Los caprichos; portraits by Gilbert Stuart, Chester Harding, and John Singer Sargent; and one of the most extensive collections of contemporary artists' books in the United States. 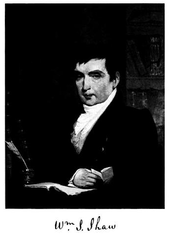 In 1803, a young Harvard graduate by the name of Phineas Adams established the magazine The Monthly Anthology, or Magazine of Polite Literature. Adams left the New England area in 1804, having insufficient funds to continue the periodical; however, the printers Munroe and Francis convinced other young men to contribute to and continue the magazine under the new title of The Monthly Anthology and Boston Review. By 1805, these young men founded the Anthology Society. The Boston Athenæum was founded in 1807 by members of the Anthology Society, literary individuals who began with a plan to have a reading room. The first librarian, William Smith Shaw, and the new trustees had ambitious plans for the Athenæum, basing their vision on the Athenæum and Lyceum in Liverpool, England. Their vision was expanded to include a library encompassing books in all subjects in English and foreign languages, a gallery of sculptures and paintings, collections of coins and natural curiosities, and even a laboratory. This ambitious design has developed over the past two hundred years with some changes in focus (e.g., there is no chemistry lab) but remaining true to the ideal expressed in the institution's seal, chosen in 1814: Literarum fructus dulces, meaning "Sweet are the Fruits of Letters." The first yearly subscriptions were sold for ten dollars; only members were allowed to enter the Athenæum's rooms, although they could bring guests. The Athenæum's collections were initially non-circulating, meaning that even members could not check out books to take home. At first, the Boston Athenæum rented rooms, then in 1809 bought a small house adjacent to the King's Chapel Burying Ground, and in 1822 moved into a mansion on Pearl Street, where a lecture hall and gallery space were added within four years. In 1823, Shaw stepped down as librarian, and the King's Chapel Library and the Theological Library belonging to the Boston Association of Ministers were deposited in the Athenæum. Work was begun on a shelf catalog in 1827. That same year, the art gallery was established, and the first annual exhibition opened. Measures were undertaken in 1830 to turn the collections into a circulating library. Once the Athenæum became a circulating library, only four books were allowed to be checked out at a time. By the early 1840s, Boston was a fast-growing city, and Pearl Street was built up commercially, with warehouses crowding around the Athenæum building. The trustees moved to construct a new building in order to facilitate access to the Athenæum. Land was acquired on Beacon Street overlooking the Old Granary Burying Ground, and the cornerstone was laid in 1847. In 1849, the current location opened at 10½ Beacon Street. 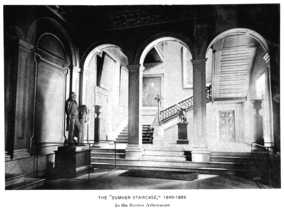 It was the first space designed for the Boston Athenæum's specific needs. The first floor held the sculpture gallery; the second, the library; and the third, the paintings gallery. The architect was Edward Clarke Cabot, an artist and dilettante whose design was selected because his ingenious arch over graves in the Granary Burial Ground allowed more space on all floors above the basement level. The neo-Palladian façade of "Patterson sandstone" was unique in Boston and remains so today. The Boston Athenæum included sculptures by John Frazee. 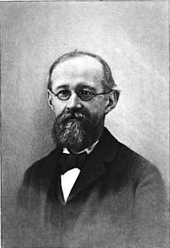 Charles Ammi Cutter became librarian in 1869, succeeding William Frederick Poole. Until this point, work had been uninspired on the comprehensive catalog of the library's holdings. The Athenæum's exhibition area opened up when the Museum of Fine Arts moved the collections into their own space overlooking Copley Square. Cutter took advantage of the space, using it to spread out the collections and to revise and complete the five-volume catalog. He created his own classification system, known as Expansive Classification, in order to revise and finish the five-volume catalog. Later, the Cutter system became the basis for the Library of Congress classification system; the sections of call number used to alphabetically designate authors’ names are still known as "Cutter numbers" in the Library of Congress system. Many of the Trustees at the Boston Athenæum participated in the movement to create a separate museum in Boston. In the years 1872-1876, Boston's Museum of Fine Arts exhibited in the Athenæum's gallery space while waiting for construction of its building to be complete. There would be no more annual exhibitions; shelves were installed and the library spread to the first and third floors. In 1913-1914, the Boston Athenæum employed the architectural firm of Bigelow and Wadsworth to expand the building. The fourth and fifth floors were set back so as not to disrupt the symmetry of the façade. This renovation fireproofed the building and expanded the space, including addition of the beautiful fifth floor reading room and the fourth floor Trustees’ Room. At the same time, much-needed shelving was installed in the form of a drum stack—that is, a ten-story Snead stack occupying a semi-circular space from the basement to the third floor. The Boston Athenæum was declared a National Historic Landmark in 1966. Between 1999 and 2002, the Boston Athenæum undertook a major renovation to update its climate control system, gain more space for books, and add new gallery space on the first floor. The Boston Athenæum celebrated its bicentennial in 2007. The mission of the Boston Athenæum is to engage all who seek knowledge by making accessible the library's collections and spaces, thereby inspiring reflection, discourse, creative expression, and joy. The Athenæum's holdings currently include over 600,000 volumes, and the collections' strengths focus on Boston and New England history, biography, British and American literature, as well as fine and decorative arts. The Boston Athenæum's rare and circulating books, maps and manuscripts reflect the collecting interests of the Library as it has narrowed its focus from encyclopedic in the 19th century to an emphasis on the humanities and its large, historic collection of art includes paintings, sculpture, prints, photographs, and decorative arts. Over 260 book funds, the oldest and largest of which was endowed by John Bromfield, Jr.. in 1845, support the addition of more than 3,000 volumes per year to the collection. 1831 Catalogue of tracts, scientific and alphabetical index. 5 v.
The first catalog, that of 1810, was compiled by the Rev. Joseph McKean. The Athenæum has digitized a wide range of its holdings, and continues to do so. The digitized holdings are described on-line and are an effort to make them more accessible to researchers, students, Athenæum members, and scholars. Portions of the personal libraries of Cardinal Cheverus, Henry Knox, and George Washington. The Groome Gypsy Collection, the Danforth Alchemy Collection, and the Merrymount Press Collection. ^ Walter Muir Whitehill, Independent Historical Societies: An Enquiry into Their Research and Publication Functions and Their Financial Future. Cambridge: Harvard University Press, 1962. ^ Boston Athenaeum. 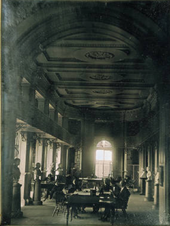 Change and Continuity: A Pictorial History of the Boston Athenaeum. Boston: Boston Athenaeum, 1976. ^ Stanley Ellis Cushing and David B. Dearinger, Acquired Tastes: 200 Years of Collection for the Boston Athenæum. Boston:Boston Athenæum, 2006. ^ Appleton P.C. Griffin and William Coolidge Lane, A catalog of the Washington collection at the Boston Athenæum; compiled and annotated by Appleton P.C. Griffin : with an appendix, The inventory of Washington's books drawn up by the appraisers of his estate; with notes in regard to the full titles of the several books, and the later history and present ownership of those not in the Athenæum collection. Boston: The Boston Athenæum, 1897. Robert F. Perkins, Jr. & William J. Gavin III, editors, The Boston Athenæum Art Exhibition Index, 1827-1874. Boston, MA: The Boston Athenæum, 1980. Wikimedia Commons has media related to Boston Athenaeum.